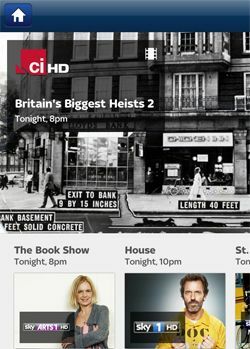 Sky+ app for iOS gets update | What Hi-Fi? BSkyB has updated its Sky+ app for iOS devices. The new version, now live on the iTunes Store, brings the app up to date for iOS 5. There's a new Now and Next feature, some big fixes to the remote record feature and a fresh interface. There's also a Showcase section within the 7-day EPG, highlighting Sky's top TV picks of the week. Series Link record remains in the 'coming soon' column for now, though. The Sky+ app for iPhone, iPod Touch and iPad allows you to access the TV Guide and set programmes to remote record once you've linked your app with your Sky account.